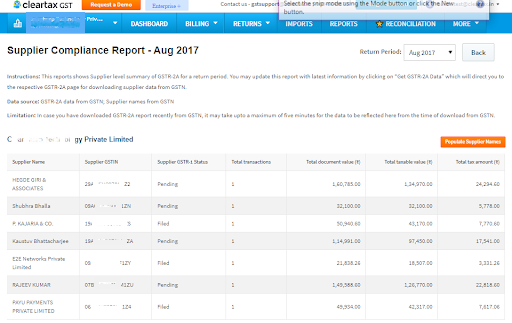 The vendor compliance report gives you a bird’s eye view of the monthly filing status of GST returns by your vendors or suppliers along with the tax summary. In our previous article, we would have learnt the importance of multi-month GSTR-2A report and its uses. The count of transactions carried out with each supplier for a month. This report is useful for a taxpayer to reconcile the GST data with vendor’s data smoothly and get a real-time update of the filing status of their GST returns in GSTR-1. Every taxpayer before filing the GSTR-3B must download the data of GSTR-2A to check the amount of eligible Input tax credit(ITC) as uploaded by their suppliers. They must reconcile this data with what is recorded in their books of accounts. Any mismatch must be reported to the supplier. Also, the month for which the GST return was last filed by the supplier always forms an important base to track filing status and hence follow up with the vendor to upload any missed invoices. Information on the suppliers’ compliance status (vendor compliance) is fetched from the GSTR-2A returns of the taxpayer, available on the GST portal. 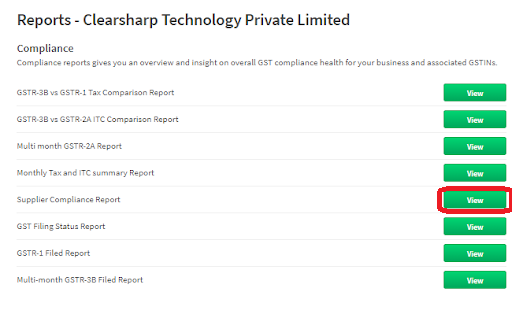 The report is downloaded from GSTN for each month up to date. GSTR-2A is the auto-populated return that consolidates the value and tax reported by all suppliers for a particular GSTIN of the taxpayer for a tax period. This report is sorted according to each supplier based on the GSTIN. Another option of sorting based on the trade name/ legal name is available too. Step 1: Login to ClearTax GST and ensure that the business set-up ( adding a GSTIN) is done. Step 2: Select the ‘All reports’ against the particular GSTIN on the dashboard. Step 3: Select the Month beside the ‘Return period’ and click on ‘Populate Supplier Names’. The data for the selected month is displayed in few minutes. 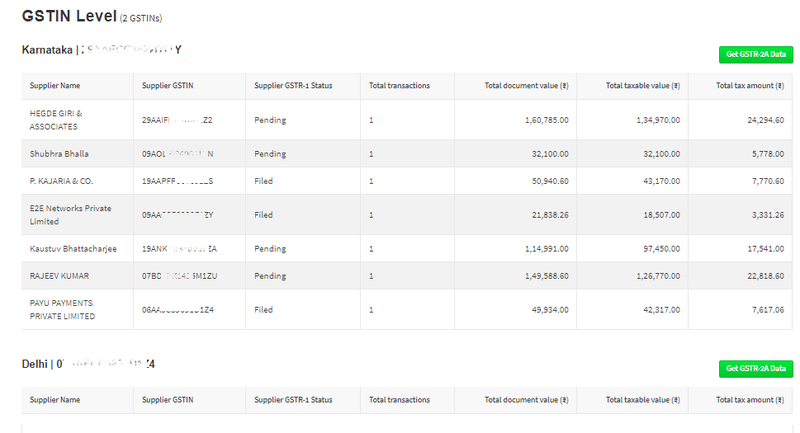 Step 4: You can now make use of the report for a timely follow up with your vendors!